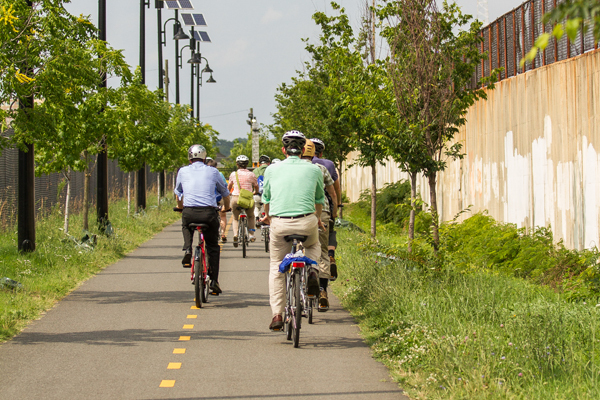 It’s been on the radar for Richmond to build new bike infrastructure for several years now. While enthusiasm for bringing bike lanes and trails to Richmond is high, our actual miles of on-street infrastructure haven’t kept pace. But that may change VERY soon. Richmond’s City Council members Jon Baliles, Charles Samuels, and Parker Agelasto have jointly sponsored two key budget amendments. One dedicates money to begin building a network of connected bike lanes across the city of Richmond. The other funds the construction of the Brown’s Island Dam Walk, a pedestrian and cyclists-only bridge across the James River downtown. This is what we’ve been waiting for, Richmond! You’ve attended meetings, written letters, talked to your neighbors, and helped to build the support we needed to get these projects on the table. This is a big win for quality of life and physical activity in our city. Together these projects can increase Richmond’s on-street cycling infrastructure by more than 300%. 300%! And that’s a win for economic development. Every mile of bike lane we add now is an investment in our local economy. 20% of Richmond households don’t have a car and a full third of Richmonders can’t or don’t drive. For our neighbors who are looking to start a new job or get a foot hold on a steady wage, good infrastructure can give them a safe way to begin commuting to work. For young professionals considering a move to our region, a network of safe family-friendly bikeways is a key attraction. If you’re a Richmonder who wants to be able to bike more, today is a very good day. Mayor Jones’s administration has been championing bike infrastructure since his first term. He’s created a dedicated position for Pedestrian, Bike, and Trails Coordinator. He’s commissioned the creation of a Bike Master Plan. And next he and city council have the opportunity to bring these amendments across the finish line!